Still “Secret” After All These Years: Why Do Pentagon Securocrats Continue to Censor Well-Known, Publicly Available Information? The Cuban missile crisis was resolved when President Kennedy secretly agreed to remove Jupiter intermediate-range ballistic missiles from Turkey along with a pledge not to invade Cuba while Soviet Premier Khrushchev agreed to remove the missiles from Cuba. That the Jupiters played a central role in the crisis is a fact available to any college freshman reading any of the many general histories of the Cold War. 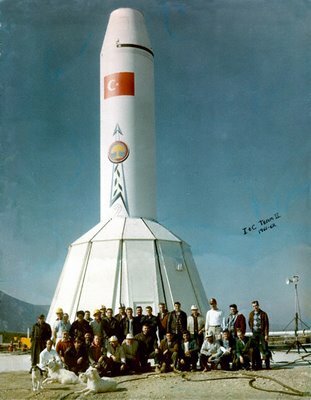 Yet from the perspective of Pentagon officials who review documents for release under the Freedom of Information Act (FOIA), the fact that the United States had nuclear-tipped Jupiter missiles in Turkey and that they were withdrawn almost 50 years ago is a state secret that cannot be disclosed even today. While collecting and comparing recently declassified documents on the Cuban missile crisis, I reviewed copies of formerly top secret notes prepared by Deputy Secretary of Defense Roswell Gilpatric. Gilpatric was a member of the National Security Council “ExComm” and took circumspect notes of the meetings, mostly relating to actions for which he had follow-up responsibilities. Today, those notes are available in two versions, one released in 2009 under the FOIA by the Department of Defense and the other in the “Sensitive Records on Cuba” collection at the National Archives. Not all of the notes are available from both agencies, but in some cases they are, allowing us to see exactly what the Pentagon redacted because the National Archives usually publishes documents in full. 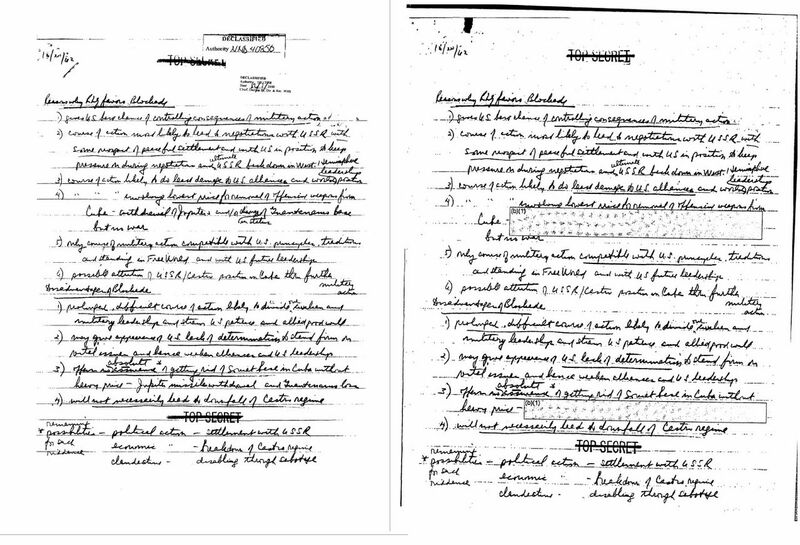 For one side-by-side comparison, see the Gilpatric notes below from October 20, 1962, “Reasons RLG Favors Blockade.” What this shows is that the Pentagon FOIA reviewers excised language mentioning the Jupiter missiles in Turkey. And yet, not only is information on the Jupiters widely available, it can actually be found in official histories published by the Defense Department, as well as in declassified documents published by the Department of State. Right: NARA release. Left: Department of Defense release with redactions protecting US National Security by not revealing that Jupiter Missiles were in Turkey during the Cuban Missile Crisis. Another example of the Pentagon’s dubious secrecy is in its release of Gilpatric’s notes on a White House meeting on Oct. 20. What the Pentagon excised was an assignment given to Assistant Secretary of Defense Paul Nitze. That he had an assignment to “study the problems arising out of the withdrawal of missiles from Italy and Turkey” is fully accounted for in the State Department’s published record of the ExComm meeting in the Foreign Relations of the United States. Another excised reference to Jupiter missiles in Turkey is in Gilpatric’s notes on White House meetings on Oct. 22, before President Kennedy made his televised address to the nation. “What is the distinction between USSR missiles in Cuba and USA missiles in [excised phrase]” is unquestionably about the Jupiters in Turkey (which were also deployed in Italy). The most astonishing excision is on page 30 of this special chronology of missile crisis decision-making that Gilpatric’s military aides prepared. On Oct. 27, in a publicly distributed letter to President Kennedy, read out on Moscow Radio, Khrushchev proposed the removal of Soviet missiles from Cuba if the United States “will remove its analogous means from Turkey.” The security reviewers excised the word “Turkey” from that statement as well as from a related statement about inspection. These excisions are the subject of a FOIA appeal which the National Security Archive filed in 2009. It does not really matter if the Archive wins or loses this particular appeal because we know what the excisions say. But the U.S. classification system loses credibility when agencies keep “secrets” that defy common sense. One point is the Security Classification Guide may need to be revised. That is what reviewers go against. The other point is sometimes you will have in the SCG, Unclassified except in (name of Country) where secret. But yeah, sometimes what is classified isn’t really secret at all. Its more of we don’t want to officially say something even if its known. But 50 years later is a stretch. Thanks for sharing your thoughts about matrix.